So Lean was forced to recreate Aqaba on an empty beach in Almería, along the southeastern coast of Spain. In May 1962, the beach was bustling with activity as hundred of local workers constructed a replica of the Red Sea port of Aqaba circa 1917. It took them three months to construct over 300 false front buildings. They planted palm trees, placed four full-size canons on the hills above, and brought 450 horses and 150 camels from Morocco. Lawrence of Arabia was one of the first large-scale international productions made in Almería. Hundreds of films followed throughout the 1960s and 1970s. Grand productions with big name stars included Cleopatra with Elizabeth Taylor, Patton with George C. Scott, The Wind and the Lion with Sean Connery, How I Won the War with John Lennon, and many others, all filmed within locations not more than 30 kilometers apart. And, of course, there were dozens of westerns, including all of Sergio Leone’s films with Clint Eastwood. But why Almería? Labor was cheap at the time, filmmakers could count on 360 days of sunlight a year, and the amazing desert landscapes could stand in for the American West, Arabia, or the surface of the moon. At the same time, Spain was undergoing dramatic changes. Franco’s Fascist government had been isolated culturally and politically since the end of WWII and was failing economically. So, led by an influential cohort of technocrats, the government embarked on a new strategy, removing economic barriers and opening its borders to trade and investment. A central part of this endeavor was the promotion of mass tourism. In addition to bringing in money, Franco believed that tourism would rehabilitate Spain’s international image to the rest of the world. Franco’s regime was particularly interested in winning American ties. They developed relationships with American companies and media such as American Express, TWA, Hilton, and — ultimately — popular Hollywood filmmakers. Spain’s minister of information and tourism traveled to the US to meet with Hollywood film studios and encourage them to work in Spain. The Spanish government established a system of co-production to provide financial incentives and attract foreign filmmakers. They believed that Spain’s image would benefit from the association with Hollywood glamour and the dissemination of larger-than-life images in theaters around the world. The strategy was a resounding success. During the 1960s, frequently referred to as the Spanish Miracle, Spain experienced greater rates of growth than any other western country at the time. Spanish leaders boasted by 1970 that Spain was the number one tourist destination in Europe. And Hollywood came to Spain. In fact, independent American film producer Samuel Bronston moved his entire operation to Madrid, producing a string of epic pictures among Spanish landscapes, including King of Kings and El Cid. But Almería became the focus of all this activity. At one point in 1968, the Hollywood Reporter noted that Almería was proclaiming itself “The Movie Capitol of the World,” commenting that “this Costa del Sol resort is bulging with eight motion pictures filming simultaneously–one more than is currently shooting in Hollywood.” The following week Michael Caine arrived for another film, making it nine. And during this same period, Franco himself traveled to Almería to dedicate a new jet airport constructed to meet the demands of foreign filmmakers. But it didn’t last. Franco died in 1975. Spain transitioned into democracy and joined the European Union. Filming there was no longer such a bargain. At the same time, a financial crisis in Hollywood reduced the number of large productions made in exotic locations. But some of the original sets and locations remain in the desert and along the coast of Almería as relics of a glamorous era. My interest in these old film locations in Almería is both personal and conceptual. I have a personal relationship with the region. My mother’s family is from Almería. I have been traveling there as long as I can remember. I visited the old western sets as a child, and I have seen the landscape change dramatically over the years as the region has developed. In my photography, I often focus on architecture, particularly abandoned architecture, and its relationship to the surrounding landscape. However, I am also interested in what architectural relics can tell us about ourselves and the invisible social and economic forces that lead to the growth or abandonment of human communities. The landscape of Almería harsh and and unforgiving. It is a desert, more like north Africa than Europe. But the region of course is not lifeless. Almería has for many centuries served as a point of passage between Africa and Europe and has seen civilizations come and go. It served as one of the busiest ports in the world when the Moors controlled Spain. The landscape is littered with ruins from across history. Prehistoric settlements, Roman ruins, Moorish castles, and 19th century mining and industry. I’m fascinated by the remains of these old film sets as a different kind of relic or “ghost town”. Of course, These buildings were never really inhabited—they were never living communities. They are a fiction, constructed solely for the movies. But there are multiple layers to this fiction. 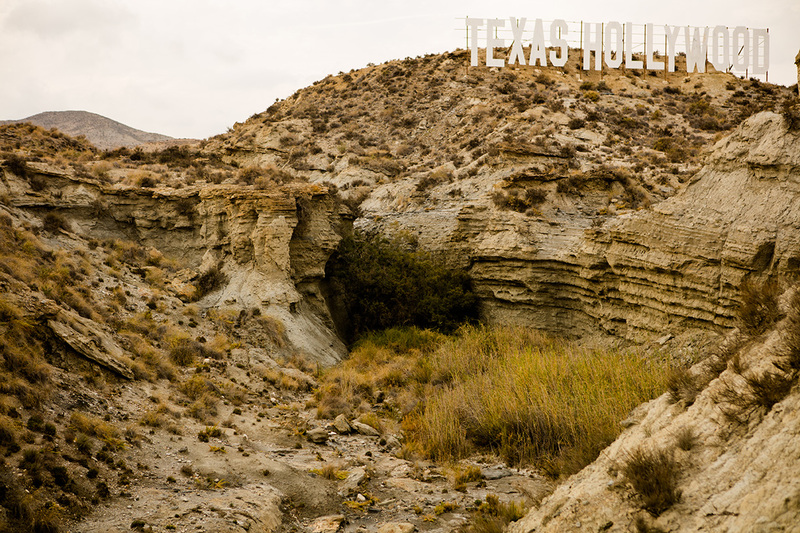 First, the film sets are not meant to be accurate representations of the American West. Instead, they were constructed to meet an (Italian) filmmakers’ vision of what the American west was like. The spaghetti western has been described as a “a myth of a myth.” (http://www.popmatters.com/pm/column/157817-sergio-leone-something-to-do-with-death) However, this myth of a myth has come to shape our own ideas about the West. Secondly, the films also created a fiction about Spain. Bringing the film industry to Spain in this period was part of Franco’s effort to change the image of Spain to the rest of the world, to promote tourism and show Spain as a country with beautiful landscapes, grand history, and colorful tradition, but also a modern country that could compete with the rest of Europe. But the version of Spain that tourists saw, either in the movies or at the resort beaches, was a fiction, freed of harsh realities. Strangely, it was this new image of Spain that historians credit as the beginning of the end of Franco’s regime. The regime wanted, on the one hand, to bring in foreign visitors and their currency, but, on the other hand, to continue to promote a romanticized version of Spain and Spanish culture that celebrated traditional rural life — white houses in the mountains, farming, traditional costumes. But in 1962, the same year that Lawrence of Arabia was filming in Almería, a decision was made for the first time to allow bikinis on the beaches in Benidorm, a major resort area serving mostly foreign tourists. This double standard became a growing source of tension which was only resolved with the end of the regime. Third, on a personal note, I grew up listening to my grandmothers’ stories of life in rural Spain. She never fully assimilated herself in the US, and her English was limited. But she told stories of growing up in the village in the deserts of Almería, which seemed distant and other-worldly to me. And the Almería she knew is mostly gone. The old film locations are relics from another time when Almería was a very different place. So when I see these ruins, some of which were never intended to be permanent structures, crumbling and abandoned, I see a connection with that time being lost. Part of my aim in pursuing this project was to try to connect with this place and with my own family’s origins. But these ruins also serve as a reminder the impermanence of our ties to the land and as evidence of the economic and social changes that drive human migration, including that of my own family.